A 10-year-old in Scotland initiated signage that raises awareness of people with "hidden" disabilities. acquire a disability as result of aging. Despite the fact that disability is a natural part of life, people with disabilities have not always had access to equal opportunities. Please support people with disabilities and consider that people may have a hidden disability. Not all conditions are visible, please be patient with everyone using these facilities. Thank you. 10-year-old Grace Warnock from Prestonpans in East Lothian was diagnosed with Crohn's Disease in 2014. Crohn's is an inflammatory bowel disease that cannot be seen from the outside. 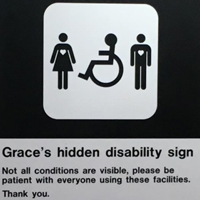 Grace noticed people reacting negatively to her using accessible toilets and she decided that changing the sign would be the best way to help people understand that some disabilities are not visible, and to urge them to "have a heart." The sign has been adopted by the Scottish Parliament, and Grace hopes that one day it will become the global symbol of accessible toilets.